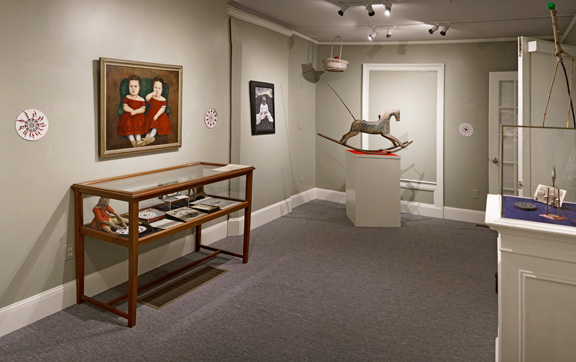 Contemporary Art at Historic Northampton exhibits the work of artists who draw on Northampton history or artifacts in the museum collection for theme or inspiration. Exhibitions rotate monthly at Historic Northampton, opening on Northampton's Arts Night Out (the second Friday of the month). The series is a partnership with the Northampton Center for the Arts and A.P.E. Gallery. Contemporary Art at Historic Northampton began in spring 2013. The Northampton Center for the Arts needed to vacate its ballroom and galleries at the D.A. Sullivan School complex in downtown Northampton and make plans to relocate to 33 Hawley Street in collaboration with the Northampton Community Arts Trust. As the Center for the Arts sought alternate gallery space, the idea of artists creating new artwork based on local history for exhibition at Historic Northampton was born. Historic Northampton, in collaboration with The Northampton Center for the Arts and A.P.E. Gallery, welcomes proposals from artists to exhibit work which draws on or is inspired by objects from the museum's permanent collection. Submissions may be for solo or group shows/installations. Two and three dimensional work in all mediums will be considered. The exhibits will be scheduled for September 2016 through June 2016. Each exhibition will open the Friday evening of the monthly Arts Night Out in Northampton (the second Friday of each month) and will be on view until the weekend prior to the next Arts Night Out. Artists who would like to apply for a show at Historic Northampton will be required to first consult the museum's online digital collections catalog of its permanent collection of photographs, archival documents and artifacts from the 17th to the 21st centuries. Not all objects have been photographed and digitized for online viewing. Access to objects and more detailed research from the rest of the collection will be available to artists after acceptance of proposals. Click here to view the digital collections catalog. Before applying, it is also essential to visit Historic Northampton to view the designated gallery space. Toyz n' Totz III by Christin Couture and William Hosie. The deadline for submitting proposals is March 15, 2016. Approximately 8-10 digital images on CD (more accepted for group shows) CDs must be readable in both Mac and PC format. Images must be JPEGS at 72 dpi with the largest dimension set to 1500 pixels. Please label the CD with your name, address, phone number or email address and a list of images. Please indicate in your application whether you wish to have your materials returned. All proposals should be emailed, mailed or dropped off at Historic Northampton labeled Attention: Contemporary Art Proposal. Decisions will be made and artists notified by April 15, 2016. Artist Elizabeth Stone, the featured artist for May 2014, created Portrait of Jenny Lind, shown above (cropped), for the exhibit, Nightingale Uncaged: Jenny Lind in Northampton. Stone was inspired by a portrait of Jenny Lind in the museum's collection. Printmaker Therese Moriarty created a series of monotype prints for the November 2014 exhibition Splendor and Sorrow: Glimpses of World War I. Moriarity incorporated World War I letters and stories of Northampton soldiers into landscape views of France and the Alps. Shown above is Letters Home. Artist Pamela Petro developed the interactive exhibition Hiraeth in Northampton: An Exploration of Longing for the November 2013 exhibition. Exhibit viewers were photographed standing behind a photograph on glass of a gravestone from the Bridge Street Cemetery holding a card with the epitaph of their choice from a Northampton gravestone.